Diogo Homen (1520-1576) is one of the sons of Lopo Homen, the official cartographer to the King of Portugal. He did not remain in Portugal but travelled to London until c1545, and then was in Venice until 1576. His work of 1559 and 1572, Atlases basically of the same geographical areas with similar setting out, are examined as well as the Portolan Chart dated 1563 as an intermediate comparison. 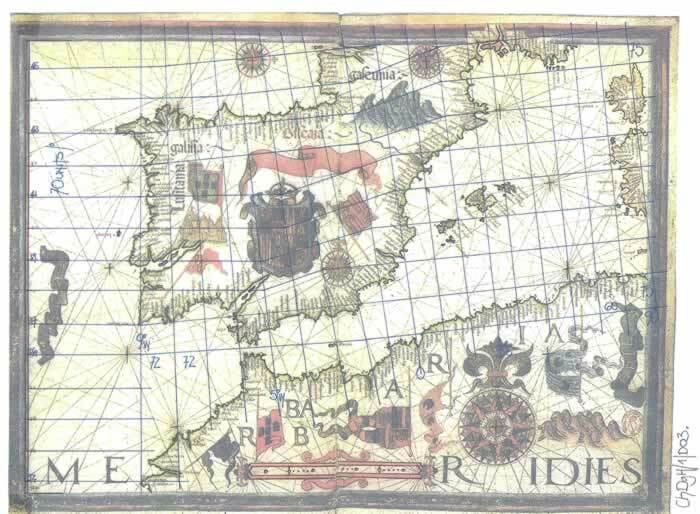 The distortion to be found on Portolan charts and Atlases is exemplified by the mis-measurements of the Iberian Peninsula which is probably the main cause of the slewing of the whole chart. 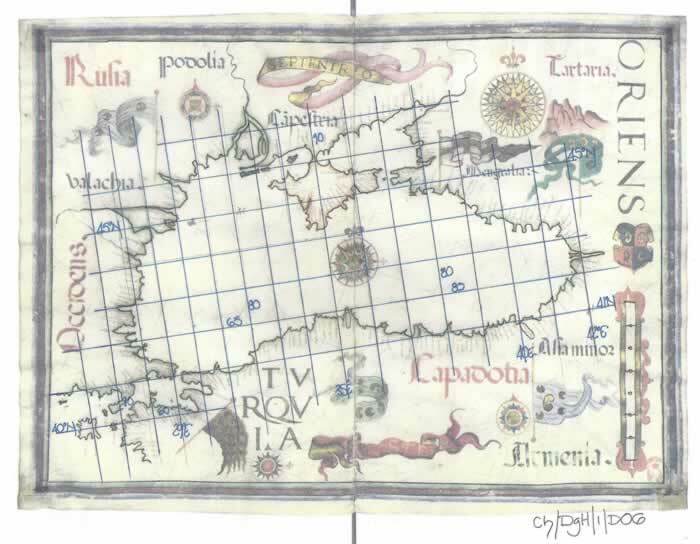 In text ChATL/1, I examined the Iberian Peninsula as portrayed on 14 Atlas charts, LCP, A1 to A14, to investigate their accuracy, but what I found was a nonsensical depiction of the Peninsula combining both the numerical Roman Miles and Miliaria numbers using one scale bar. Hence problems for the whole chart ensued there-from. Commencing with a short resume of that text, I now examine the beautifully drawn Atlases and charts by Diogo Homen dated 1559 onwards. 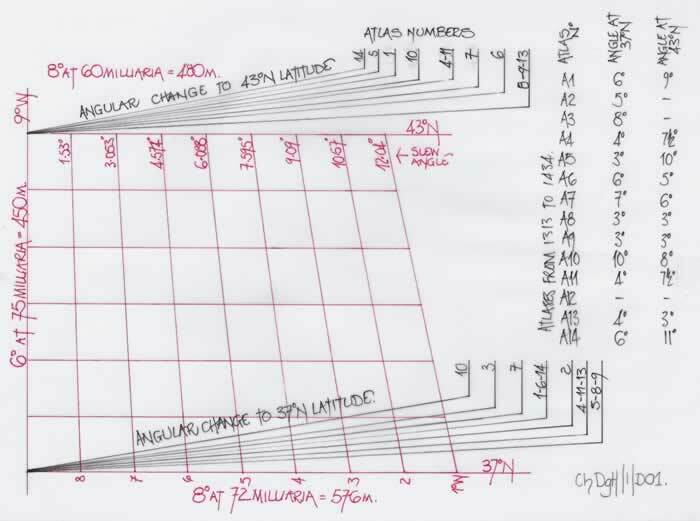 The simplest method of illustrating the problems with the 14 Atlas pages is to combine their distance measures and hence their distortion angles onto one diagram as ChDgH/1/D01 illustrates. It sets down the basic parameters of Roman Measures west and north of the peninsula and the Miliaria measures south and east, using 75/60 and 90/72 measures both taken from the same scale bar. Thus it is possible to indicate the angular changes at both 37N and 43N latitude which varies from c3 degrees to c11 degrees, the typical supposed magnetic declinations found by other researchers. In fact the change of measurement unit from 75 to 90 can be shown to be a quite precise 12 degree slew anti-clockwise. However, the fact that most Atlas charts have varying angular change north and south indicates a lack of understanding of the distance measures being applied to these charts and a changeable accuracy by the draughtsmen. But it could emanate from other factors. 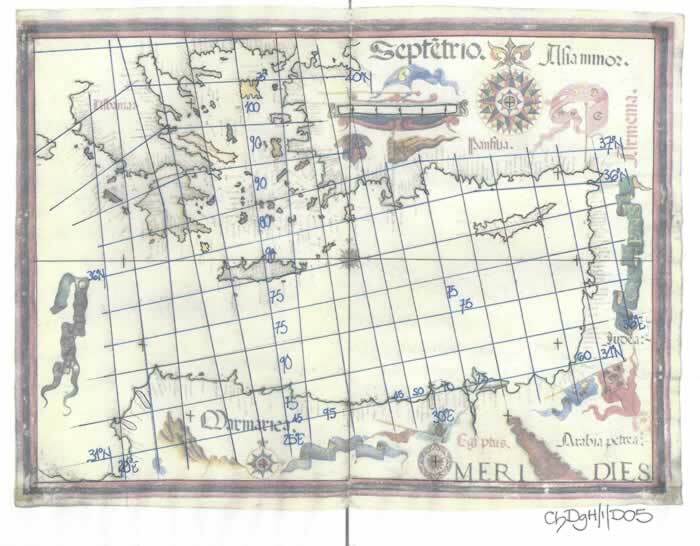 DIOGO HOMEN 1559 ATLAS; 8 CARTES, 440 X 586mm. This Atlas Nautique has seven charts and a calendar page as the eighth and are as follows; 1) British Isles and France; 2) Iberia; 3) Italy & Adriatic; 4) Eastern Mediterranean Sea; 5) Black Sea; 6) Adriatic Sea; 7) Aegean Sea, & they are individually assessed. A beautifully presented Atlas page illustrating the British Isles, the west coast of France and the north coast of Iberia. Along its western edge is a latitude scale from 41N to 60N, which position the various parts of the chart quite successfully, but, the scale bar indicates that each degree of latitude averages to 66 units. Thus a geographical degree of 111Km would be 66 x 1.68182 Km; or 66 x 1.0451 Statute Miles. Thus these are not normal distance measures and could be the result of paper shrinkage, which must be a possibility. If the wind rose is measured east/west it appears to be per division, 190/163/109/38, a total of 500 units. (The western point is now hidden under the latitudinal scale). The north/south distance measures 490/480 units and thus accounts for the 1.0451 discrepancy in the Statute Mile measurement and hence we may consider that the latitudinal units should be 69(70) per degree. I have already opined that the statute mile could be represented on these Atlas pages as the difference between 69/70 and 75 is quite marked in overall terms. Hence if George Lily’s map of England, dated 1546 (drawn in Rome, see CgEM/1) was copied as both woodcuts and copper engraving in Venice 1556 to 1563 (but had already been printed in England in 1555 and Antwerp in 1549), on it we find that the measurement north/south, the latitude, is 0.94 statute miles and east/west is 0.91 or 0.92 statute miles, this becomes a mean length of 66.2 or 61.2 statute miles which he calls “Italian Miles”. Britannia is thus expanded in latitude by the scale bar, but actually with a numerical assessment it could be considered as correct. By the scale bar from 51N to 60N it is 9 x 66 = 594 units. But, Britannia is 50N to 58.5N which is actually 587 statute miles when 69 SM are used or 595 statute miles when 70 per degree are used. Thus latitudinally it is drawn correctly to the actual measurement and the Statute Mile may be considered present.Scotland however is well drawn except that the Mull of Galloway west of the Solway Firth has probably been confused with the Mull of Kintyre to the north and hence the form of Scotland at this point is totally awry. Ireland is drawn with its northern shore reasonably correct to the mainland, but obviously much too far north by the latitudinal scale, whilst its southern extent is actually correct to the charts latitudinal scale. These errors are typical of the charts of this era. 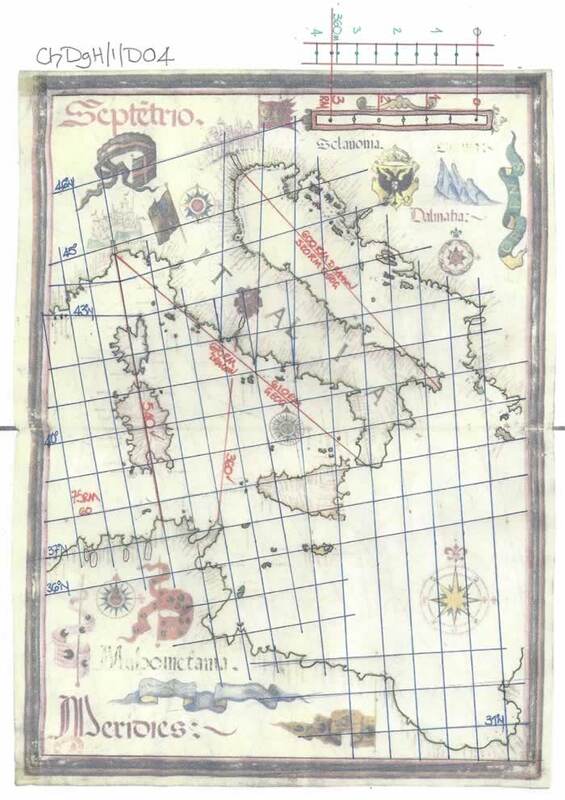 On this Atlas page from the scale bar we can immediately see the possibility that Chart 1 should measure 70 units per degree of latitude and they would thus appear to be either the English unit or 0.933 x Roman Mile, echoing the reduction discussed above and labelled as “Italian Miles”. That is of course, 0.933 x 75RM = 70 units. But the longitudinal measure commences as 72 units, which is the correct ratio for a 90 Miliaria degree, and then changes at the 9E longitude through Corsica/Sardinia to 75 units latitude and 60 units longitude, proportionally correct, but obviously a different measurement basis. Each and every possible distance measure is encompassed in this beautifully produced atlas page, but it is also totally awry. Using the scale bar it can be shown that the latitudinal degree is 75 units and the longitude is proportionally correct at 60 units. But there are obvious discrepancies in the Gulf of Sirte and the northern Adriatic Sea areas. The distance measure along the putative 9E longitude is correct at 540 Roman Miles as is the Rome to Cape Bon distance at 360RM. But Italy itself is drawn over length because the northern latitudes elongate from 43N to 46N. I have indicated the probable difference in the scale bar from 300 to 360 unit length. By studying the latitudes it is obvious there is a basic 75 units per degree of latitude for this Mediterranean Sea area, but that it enlarges to 90 units per degree for the Aegean Sea area. 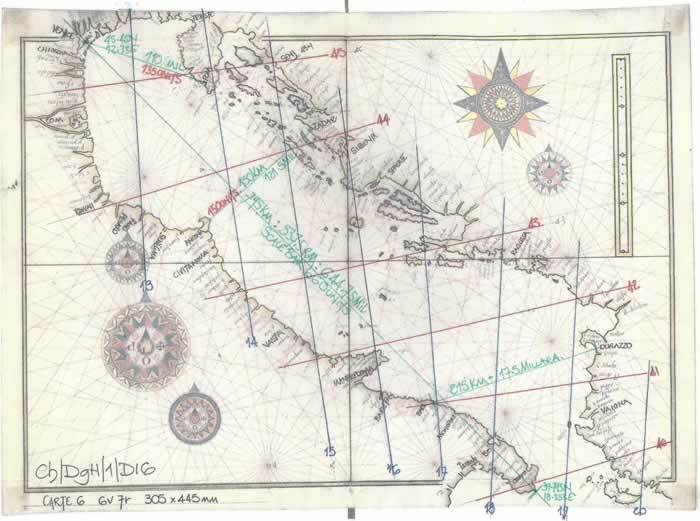 This is a “normal” error and is seen on most atlas pages and portolan charts, with a single degree over latitude. The longitudes vary considerably but an average from 20E to 36E gives us 70 scale bar units per degree. The scale bar for this Atlas page is very close to being that of the preceding Atlas page 4, but, the chart has an 80/65 unit graticule in the west, which is probably correctly proportionate to the standard 90/72 units at 36N. However the Black Sea is drawn over length, as with most charts, and the change occurs at the 35/36E line to achieve the length. The basic setting out of the east coast of Italy from Venice to Cape St Maria di Leuca is quite acceptable. It is positioned apropos the Dalmatian coast reasonably accurately, but trying to fit a graticule to this chart indicates that some correct distance measures hide an internal distortion. The diagram shows the variation across a spectrum of measures when the basic graticule should be 90/72 miliaria. It is a beautifully drawn but flawed chart. 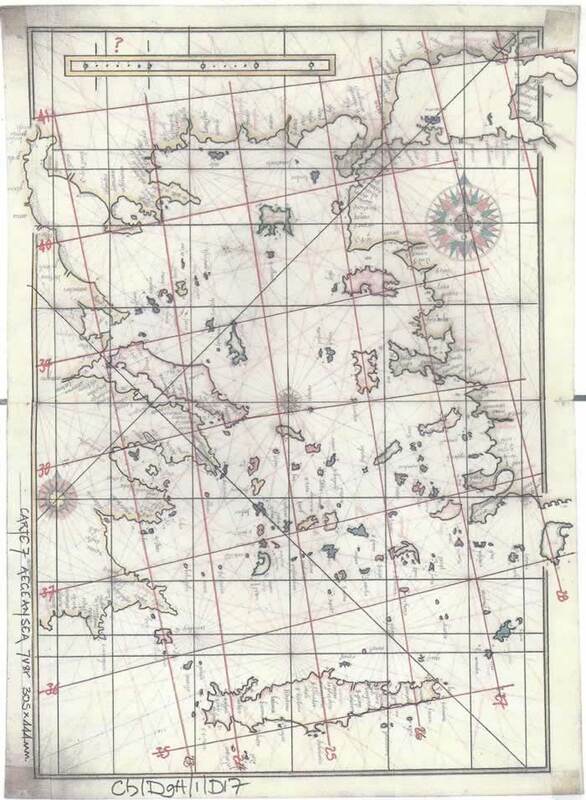 This atlas page encompasses the whole Aegean Sea from Crete to Saloniki that is from 35N to 41N latitude. However the average latitude as drawn is 102.5 miliaria, i.e. 615 miliaria total when those 6 degrees should equal only 540 miliaria and thus there is a 75 miliaria expansion. Longitudinally an average gives 82 miliaria for 5 degrees which is of course the correct proportional measure for a latitude degree of 102.5 miliaria. As these proportions are correct then it is probable that the scale bar has been drawn wrongly and should be increased by c13%, when the readings will be 90/72 miliaria. But as with many other charts the Aegean Sea has been drawn approximately one degree extra latitudinally and thus the premise of a poorly drawn scale bar may be wrong. I have indicated the possible scale bar which gives an average latitude of 90 miliaria, and as the original expansion as drawn is generally to each degree of latitude I am inclined to accept Diogo Homen may have inadvertently drawn the wrong scale bar and that his rendition of the Aegean Sea may in fact be a first to be correct, but it could also be a lucky copy. Firstly I always try to ignore the beauty of a drawn chart or Atlas page. It serves no purpose in a forensic examination to be side-tracked in an examination of the methodology used to construct the chart or atlas page. But I cannot be immune to the pictorial elegance before me in these examinations, and these by Diogo Homen are some of the finest extant. 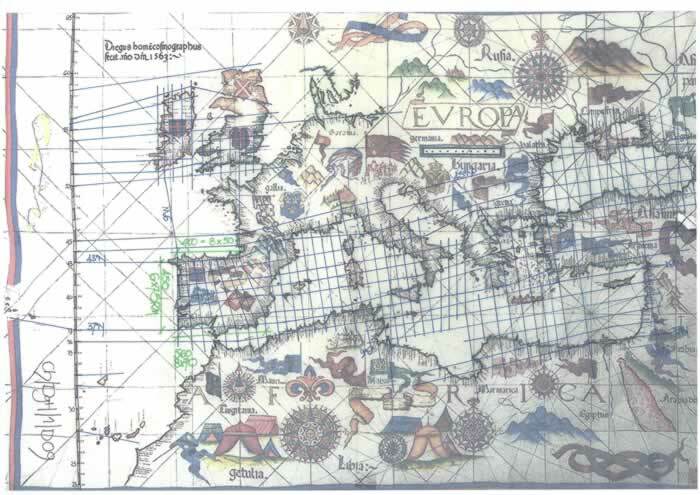 But, and it is a big “But”, Diogo Homen is not a cartographer as we would use the noun, he is a copyist and has merely promulgated charts and Atlases which have existed from before 1300AD. Minor additions have been made in the 250 years, the Canary Isles and African Coastline to 23N have been added along with Madeira and the Azores, both Portuguese explorations, but a marginal improvement to the overall knowledge. Thus from this 1559 Atlas it is quite obvious that Diogo Homen has no further new data to add and is merely copying from original templates. Diagram ChDgH/1/D09 from the Biblioteca Nazionale Florence; 780 x 1200 mm. Having a latitude scale bar set vertically between the Canary Isles and the Azores helps considerably in the analysis. Firstly each degree is of 75 scale bar units, from which I have indicated the basic distance measures for the Iberian Peninsula. The overall setting out is well executed with the typical distortions for the east of Iberia and the Aegean Sea. 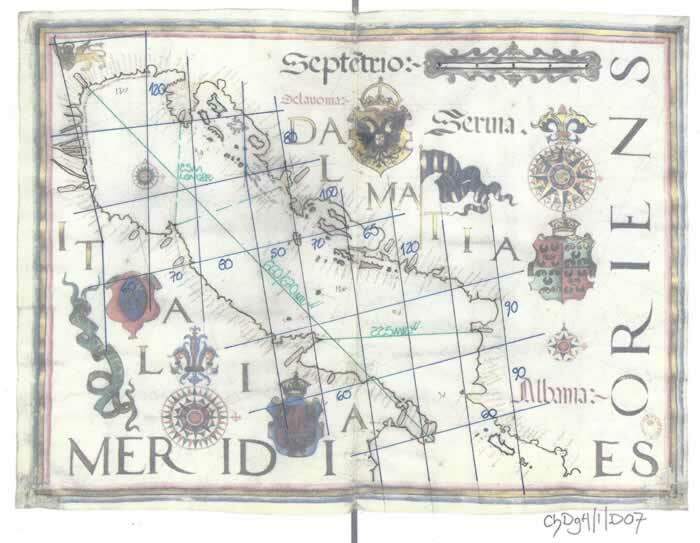 The chart compares well with the 1559 Atlas but it is obviously, as with many Portolan Charts a well executed copy of an original template. Its size at 780 x 1200mm probably called for an enlargement process from the template and given the extra-ordinary wind rose lines drawn there-on, both the chart and Atlas pages of Diogo Homen’s oeuvre, they would provide for an excellent internal grid to pin point each coastal feature and transfer from the small to the large. It is excellently drawn but still typical of the preceding 250 years. The charts within this Atlas have slightly varying sizes as indicated on the diagram. 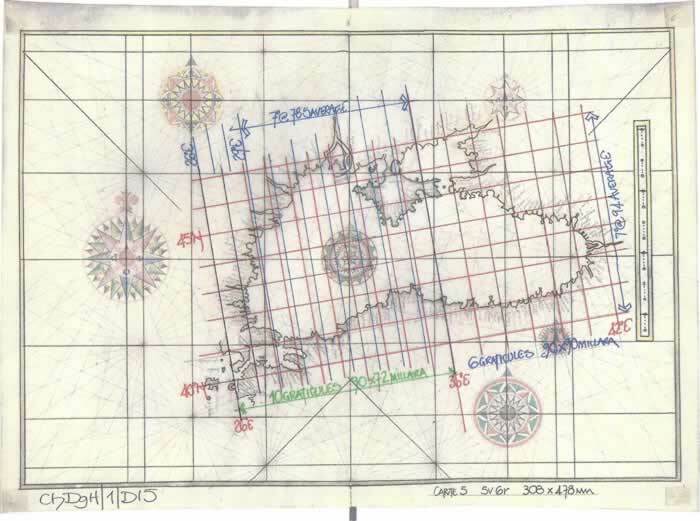 However the wind rose setting out has been used to determine the basic dimensions of the atlas charts on the page. 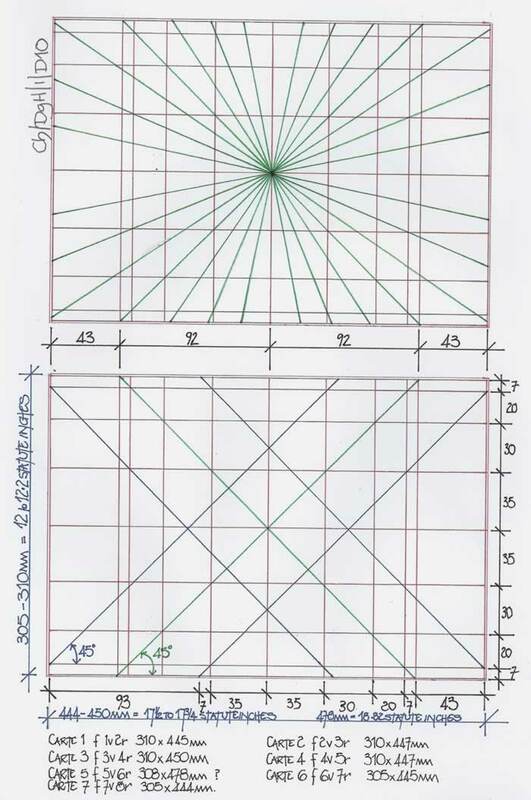 Thus 45 degree lines through the centre determine the height of the page and then the length is determined by 45 degree lines taken from the major central division of the wind rose through its smallest division to the smallest division horizontal alignments. Hence what appears to have been the ideal was a double usage of the wind rose geometrical proportions, 35/30/20/7, totalling 92 units, but in fact the geometry provides for a one unit oversize, 93 units. Did it matter? I think not! CARTE 1, f1v2r, 310 x 445mm. British Isles and west coast of Europe. This atlas chart is provided with a latitudinal scale which can be assessed from the scale bar and is 72 units averaged over 10 degrees. It is quite open to opine though that a minor discrepancy in the draughting of the scale bar setting out would in fact allow for the latitudinal measure to be 75 units. However as can be clearly shown the latitude scale and chart are not in accord with the distance from 43N to a putative 58N, where it averages slightly over 80 units per degree. The latitudinal scale is 75 units per degree and the west coast of Iberia is drawn thus with the south coast having longitudes of 70 Units. Thus I can opine it is a standard Roman Mile to N & W and Miliaria to S & E.
The Canary Isles and Azores are drawn in their general graticular positions as indicated and are positioned longitudinally by a 60 unit degree which is the correct proportion for a 75 unit Latitude. A classic distortion is evidenced here with Iberia drawn with 75 units per latitude which then change to 90 units per latitude and thus the slewing of the chart occurs. I have noted that set against the putative 9E longitude through Corsica and Sardinia, Italy is set at the correct angle and is drawn to a Miliaria distance measure. 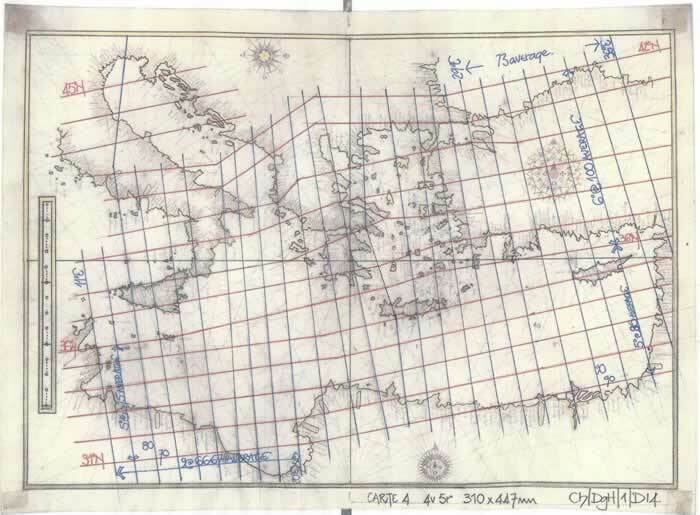 Visually a first rate rendition of the eastern Mediterranean Sea, but a detailed examination indicates that the copying introduced, or just copied, a variety of distortions and mis-measurements. The by now standard distortion of the Aegean Sea is visible and thus the extra slewing of the Black Sea will inevitably occur. As with most charts of the Black Sea, the western portion is quite well drawn to scale from 29E, Constantinople to the Crimea, 36E. Then the eastern section expands to produce the over length from 910 to 1040 miliaria, that is overall from 28E to 42E. 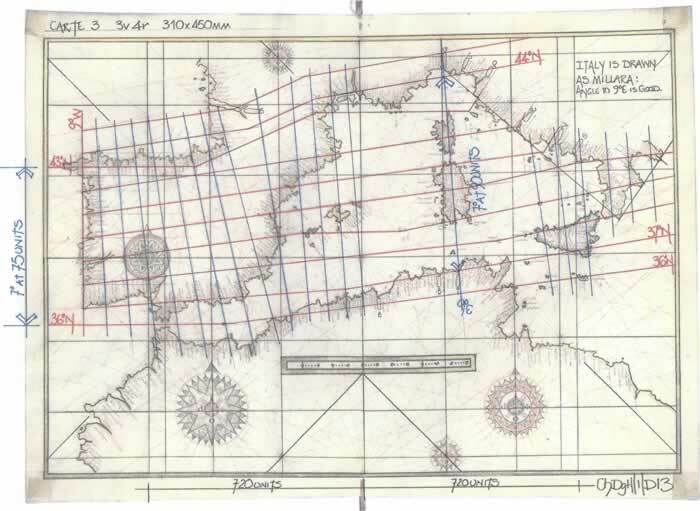 The double setting out indicates the difference in the position of The Dardanelles which gives an accurate 90 x 72 miliaria graticule, but from Constantinople eastwards it is 78.5m average, but on carte 4 this is a 73m average. The control of distance measures in the copying is thus sadly lacking. The graticule speaks for itself with an average of c96 miliaria latitude from 40N to 45N and c73 miliaria longitude. That can obviously be concluded as a basic 90/72 miliaria standard graticule. The overall length of Italy from Venice to Cape St Maria di Leuca is correct as is the Bari to Durazzo distance, but further north the Adriatic Sea is drawn slightly wider than geographical. A normal problem on these charts in this area is that the Islands of Brac, Hvar and Korcula which are geographically an east/west format but are always shown slewed clockwise by varying degrees. It is drawn with latitudes of 100 miliaria and longitudes of 72 miliaria which indicates the ‘normal’ expansion from 35N to 41N, 540 to 600 miliaria, and thus the extra ‘degree’ is inserted, but perhaps this distortion is not as much as other charts. 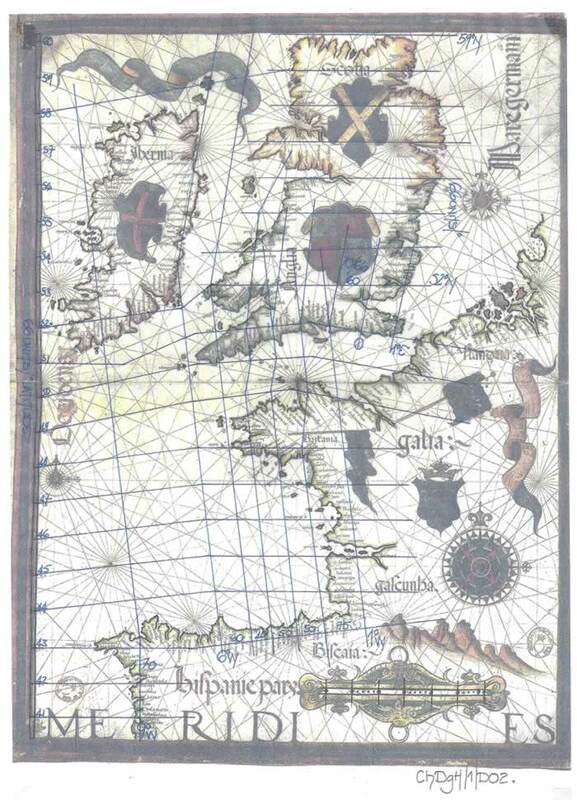 There is very little change in the technical presentation from the 1559 Atlas to the 1572 Atlas, with both indicating similar problems of mis-measurement and distortions that have been seen on charts and atlases from 1311 onwards. Thus this leads me to one conclusion, that these charts are being copied from templates which are undoubtedly over 300 years old and probably 1000 years old. 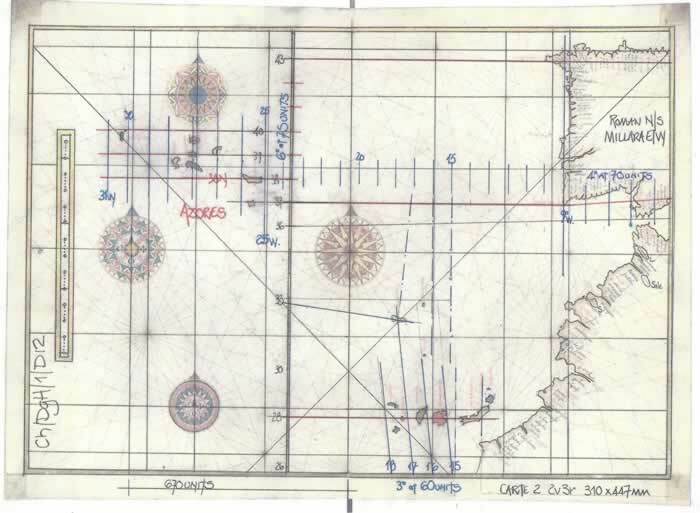 It also indicates that Diogo Homen, although an excellent draughtsperson, a maker of beautiful charts, lacked the expertise vis a vis distance measures and the continuity of a graticular layout. 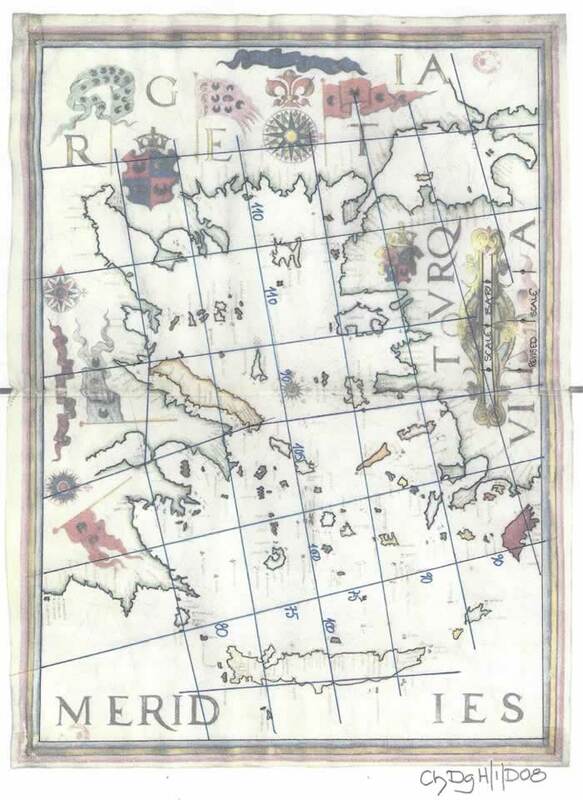 The Portolan Chart dated 1563, an interim construct, merely illustrates the continued usage of original templates and as it tends to match the atlases drawn, just one template. The most worrying point to be made is that from 1311 to 1572 there is very little advance in the technical ability or presentation of these Atlases or Portolan Charts in those years. If somebody had a compass and explored the whole Mediterranean Sea basin to compile charts it certainly does not show in the extant works being researched. Where is the development, the correction of major distortion factors, the correction of distance measures and the understanding that the Roman Mile of 75 per degree of latitude is identical to the 90 Miliaria measure for the same degree. If magnetism plays a part, where is the change from 1300 to 1500 AD in magnetic declination? Did nobody understand or bother to check it? 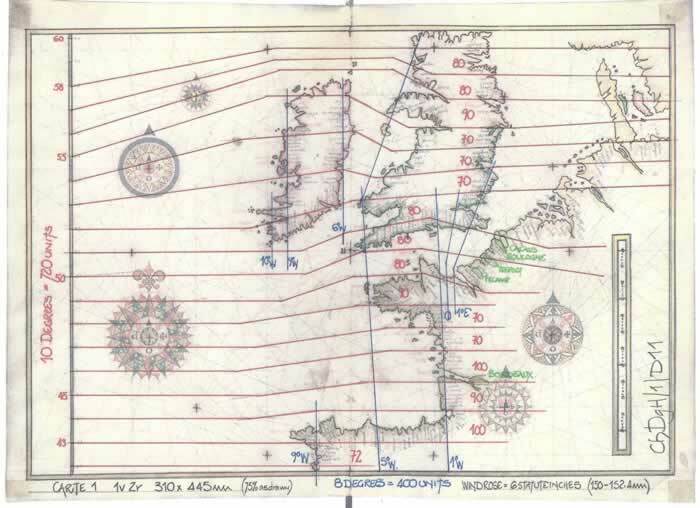 Thus I conclude as before that there is no magnetic declination in these atlas charts and that they all tend to be copies of one or very similar templates. They are not surveyed and are certainly not usable for sailing in the Mediterranean Sea. If anybody chose to measure by their scale bars they would be rather surprised given the evidence I have indicated. M J Ferrar October 2017.